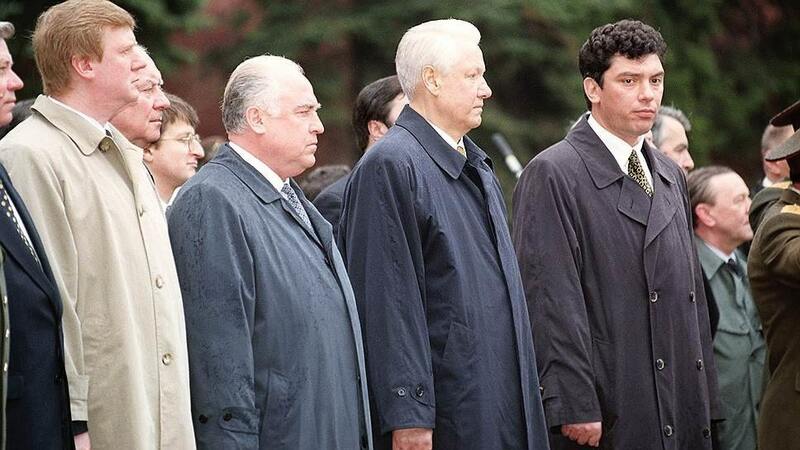 Anatoly Chubais is the Russian politician who under President Boris Yeltsin led the privatisation via voucher together with Prime Minister Yegor Gaidar in 1992 to 1994. 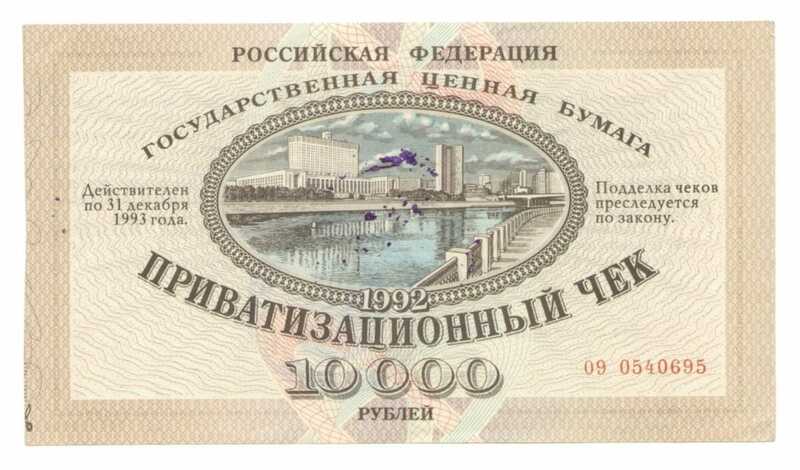 Theoretically every Russia received a voucher which entitled him (or her) to a proportionate share in the national wealth of the state enterprises. In practice, foreign concerns through Russian front men bought up large numbers of vouchers which they were able to trade for $10 or a couple bottles of vodka to naive and disillusioned workers. Effectively state run enterprises were being sold for the value of six months sales. The privatised companies schemed to avoid paying both workers and taxes and largely exported profits through middlemen companies. Voucher privatisation was the carpet bagging of Russia. Chubais who is still lurking around as the head of RosnanoRosnano who have managed to squander $4 billion of Russian government investment to build a company with $25 million in annual revenue with operating losses of $80 million year. Russia is one of the poorest and energy wasteful states. He added that a major part of the population is poor or very poor. Mr. Chubais is certainly correct that Russia does not handle its internal energy needs very efficiently. There are an enormous number of Soviet era utility vehicles still working cleaning streets and moving snow or even buses that simply guzzle gas or diesel. Not only is their fuel consumption wasteful, they do a stunning job in increasing smog in Moscow and every single provincial town. Moreover much of the heating grid is via hot water pipes from central plants. Many old apartments have radiators which cannot be adjusted. The only way to lower the temperature in winter is to keep the window open. Insulation is an afterthought in Soviet design. There’s plenty of gas and building with insulation is expensive. Certainly there is scope for a gradual transition to more efficient consumption of energy which would benefit Russia by creating a great surplus of oil and gas to be sold abroad. Gradual transition is the keyword here. It wouldn’t benefit Russia one iota to spend a fortune on foreign general purpose utility vehicles and buses without creating their own production lines. The same applies to insulation – the need for insulation is so great that production should be Russian-based, working with Russian raw materials. The basic principles of insulation are clear the world over, the most important patents in production long expired. There’s no need for the most efficient or lightweight or expensive insulation. There’s a need for a great deal of good insulation. But Mr Chubais accusation that Russia is one of the poorest states in the world is simply nonsense if solvency is one of the measures. Russia runs an approximately $20 billion trade surplus. Russia’s debt is about $450 billion on a GDP which oscillates between $1284 billion and $2297 billion depending on how the ruble has been valued on currency markets. This means that Russian external debt is approximately 20% to 30% of GDP, even denominated in dollars. This compares very favourably to Japan at 220%, Italy at 137%, Belgium at 115%, USA and Spain at 106%, France at 99 or UK and Canada at 90%. Another mitigating factor for Russia is the presence of currency reserves of $467 billion. Currency reserves include both foreign currency deposits and gold holdings. Russia’s currency reserves exceed external debt, effectively making Russia’s external debt 0% of GDP. Japan also holds huge currency reserves with GDP of $4.872 trillion (2017), national debt of $10 trillion (2017) and currency reserves of $1.253 trillion (2018) which reduces Japan’s huge ratio of debt to GDP from about 220% to about 190%. In addition to foreign reserves, Russia also has a National Wealth Fund with $65 billion of assets. Due to lower oil prices though the Russian National Wealth Fund has shrunk from a maximum of $160 billion. Some part of these funds are includes in the forex reserves above but it’s still significantly tilts Russia’s debt to GDP further to a plus. Certainly by the conventional measures of debt ratio and external currency reserves, Russia is not a poor country. Indeed, it is one of the richest countries on earth by these measures with the lowest net government debt of any significant economy on earth (indeed a surplus). That’s the numbers. Here’s a more polemical comparison of the United States and Russia which I find instructive. If those pesky Russians would just listen to the ‘chosen ones’, they too, would be like the U.S. Where 50-60 million live in entrenched poverty, 60 million living on food subsidies from the government, about 100 million out of work, disabled and/or both. 2.5 million people in prison, the highest in the world by capita ratio by leaps and bounds, 3500 sentenced to death, 90,000 wake up every morning in solitary confinement, spending 23 out of 24 hours in a cage the size of a parking space. The rate of illiteracy is staggering, and the number of people, in the tens of millions hooked on opiates, Heroin and Fentanyl. And with it a staggering number of overdose deaths and near deaths. Major cities, like Detroit, Michigan, look like bombed out post apocalypse wastelands. Tent cities everywhere you look, with downtown Los Angeles called ‘skid row’ due to the homeless epidemic they have there. And this goes for most big cities. Hopelessness and despair gripping millions, with no end in sight. An entire region of the U.S. called ‘The Rust Belt’ due to decaying infrastructure, torn up roadways and highways. 60 million ignorant, moronic Americans in ‘ The Bible Belt’ believe that the creation, and maintenance of Israel (contrary to 70 U.N. Resolutions , international conventions and norms) will usher in a divine ‘Rapture’ and that they, and only they out of the whole of humanity will be ‘saved’ and that the Jews will convert to Christianity overnight. High time that Anatoly Borisovich looked at where Russia is now in comparison to where it was when he and his partners in crime pillaged the remains of the Soviet Union. Unlike the United States, Russia is making progress in the fight against poverty, development of the economy and in building infrastructure. It’s unlikely that Anatoly Borisovich or his fellow traveller Transatlanticists are making much progress in persuading Russians to return to the days of perestroika. Frankly, Mr Chubais’s efforts on behalf of Russia would be better rewarded with a jail cell than a government office. Previous Post Will banning Chinese products rebuild American Manufacturing?